" Thank you for providing us with such an awesome day out...Your knowledge of the wildlife was amazing, obviously you have a real passion for it. As we happened to be in a very small group we felt that we were looked after especially well...We are looking forward to coming back again next year! " Read more guest reviews Book your trip today! Experience a marine adventure like no other with Dolphin Blue. 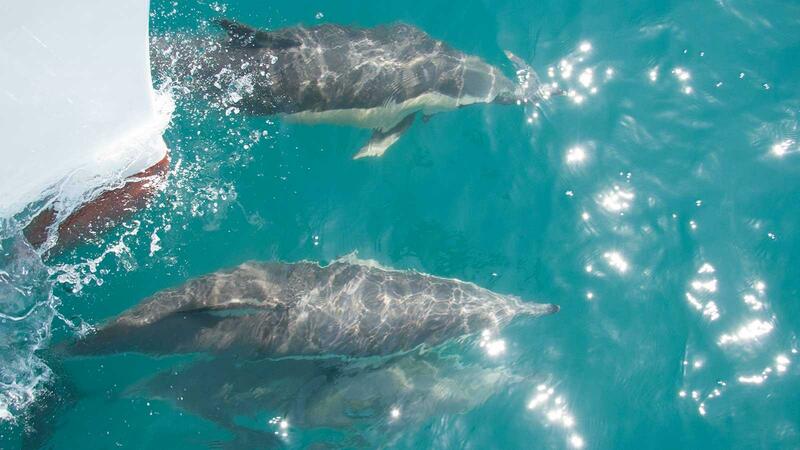 Swim with dolphins, observe fur seals explore the Bay of Plenty, all aboard the comfort of the Commander 1. Enjoy an exclusive trip with Dolphin Blue with our private charter. We can tailor a trip to suit your needs on board our luxury vessel. Discover the Bay of Plenty with Dolphin Blue! Enjoy the comfort of the Commander 1 during your dolphin tour or hire a private charter for your own exclusive adventure in the Bay of Plenty. Seeing is believing! Have a look at our image gallery to see pictures from our tours and adventures. Spend a day with us aboard Commander 1 locating, watching and swimming with dolphins. Also observing other marine life. We also offer other en-route activities- snorkelling, swimming or relaxing onboard. Click here to check out our latest video. Passenger numbers are limited to 15. This ensures your interaction with dolphins and other marine life is greatly enhanced. If you choose to get into the water to swim with dolphins you will be supplied with wetsuits, snorkelling equipment and will have the full support of our experienced crew. Morning tea and beverages provided. Please remember to bring your lunch. The Bay of Plenty is not only home to dolphins but has an abundance of marine and bird life such as whales, seals, sunfish, seabirds and New Zealand's own blue penguins, so there is never a shortage of things to see on a trip out of the Tauranga harbour! Your Captain, Paul Aitken, will take you on a one-of-a-kind tour of the Bay of Plenty to discover beautiful wildlife that makes this corner of the world so special. Read what our guests have to say about their experience with Dolphin Blue. Your adventure in the Bay of Plenty can be a magical one too!